This page will provide you with information about wisdom teeth removal. For further details, please speak to your consultant. Wisdom teeth are third molar teeth situated at the very back of your mouth. These teeth generally come through (erupt) during adolescence or early adulthood. 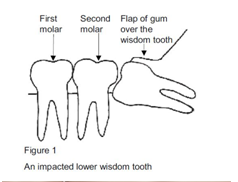 It is not uncommon for wisdom teeth to only partially come through or get stuck, which often leaves a flap of gum over the tooth (see Figure 1). In other instances, the tooth can over erupt and grow too long. A wisdom tooth may need to be taken out for a number of reasons: to prevent gum or cheek damage, due to tooth decay, because it is repeatedly causing infection, or to clear space for nearby teeth. Painkillers and paracetamol are often prescribed to people suffering from mild pain. Infections can be treated with antibiotics or through using chlorhexidine mouthwash or salty, hot water. However, these solutions provide only temporary relief and are not long-term solutions. A long-term solution would be to surgically remove the wisdom tooth, as this will prevent any symptoms returning. If the flap of gum over the wisdom tooth is causing problems then it is possible to have this removed in a procedure known as an operculectomy. Upper wisdom teeth tend to be less problematic and can usually be removed under local anaesthetic. Lower wisdom teeth, however, can sometimes be more difficult to remove and often require general anaesthetic. The type of surgery you undergo will depend entirely on your individual case, and the severity of your problem. The procedure can take anywhere from 10 minutes to an hour. The majority of patients are generally able to return home the same day as their surgery. Your consultant may prescribe you antibiotics but this will depend on the severity of your procedure. It is advised that you refrain from bathing in hot water, drinking alcohol or exercising for 1-2 weeks after the operation, as this will help limit any bruising, bleeding or swelling. Most patients will rest for a week before returning to work. Exercising on a regular basis can help speed up the recovery process; however, you should discuss this with your consultant first.